As my fond memories of Brazil grow, so does my appetite for all Brazilian snacks and treats. Brazilian cheese rolls happen to be a real favorite of mine. The last time I passed through Rio, I had some filled with cheese — as well as other types of fillings. 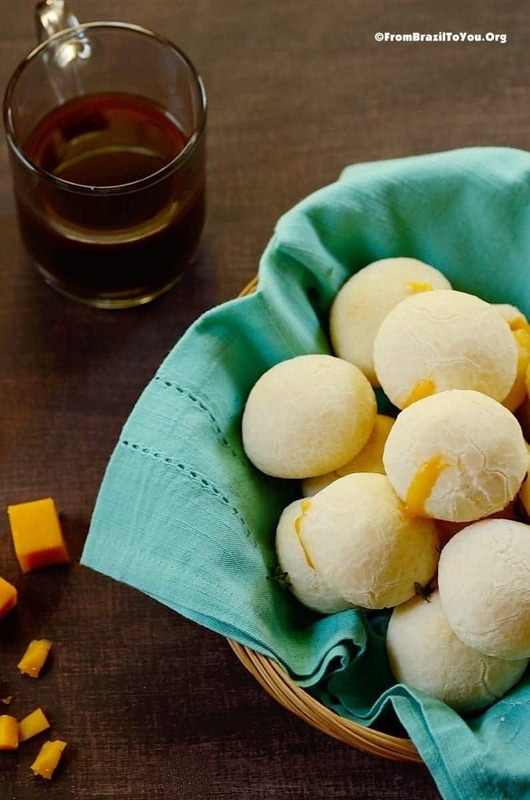 As nostalgia was calling me homeward through food, I found myself preparing these naturally gluten-free Cheddar filled Brazilian cheese rolls (pão de queijo recheado com cheddar) —which pairs so great with coffee. How about some cheese rolls? … this small baked good is easy and quick to prepare and delivers flavor with every single bite. The best part? You don’t have to be a great cook to come away like a hero. Mixing the ingredients, cubing the cheese to fill small portions of dough, and then baking is ALL that you have to do. Pure enjoyment will fill both your mouth and soul! 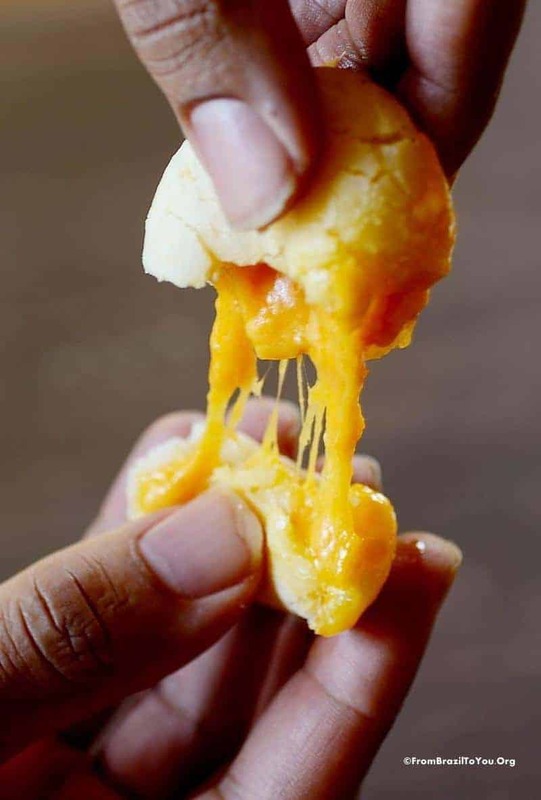 In the Brazilian state of Minas Gerais, pão de queijo has been around since the eighteenth century, but its popularity spread to other regions of the country after the 1950’s. I would say that it is one of the most popular snacks in my home country. It is relatively inexpensive, and often sold on the streets, in snack bars, cafes, airports, bakeries, Brazilian steakhouses, and supermarkets. And that’s not all! 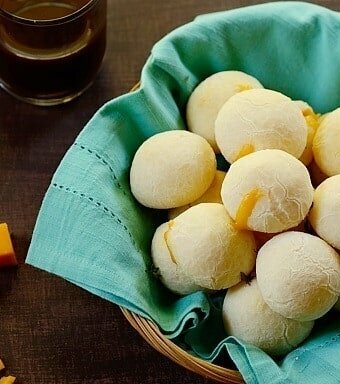 These Cheddar filled Brazilian cheese rolls make a great snack, breakfast, and small party bites. Is there a televised sports event coming up? Surprise your crowd with these comforting bites and you’ll score major points. But if you thought all the commotion about pao de queijo is just limited to Brazil, you’d be dead wrong. 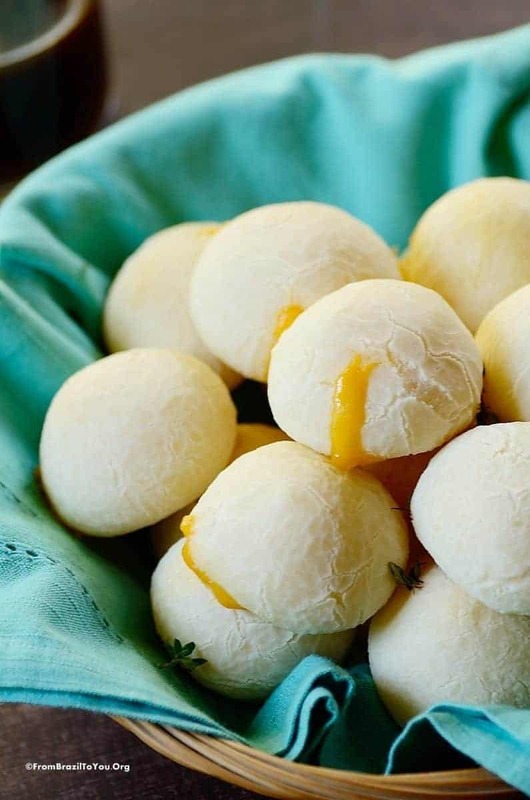 Pão de queijo is beloved in several other South American countries and even in Japan, where it is usually made with rice flour instead of tapioca flour. It is also becoming more and more popular in the USA now through the influence of Brazilian steakhouses (churrascarias). And this is one of those recipes that my American friends have most inquired about. But you know what? You won’t find them filled with cheese at any churrascaria. So grab your cup of coffee and enjoy our finger-licking rolls. 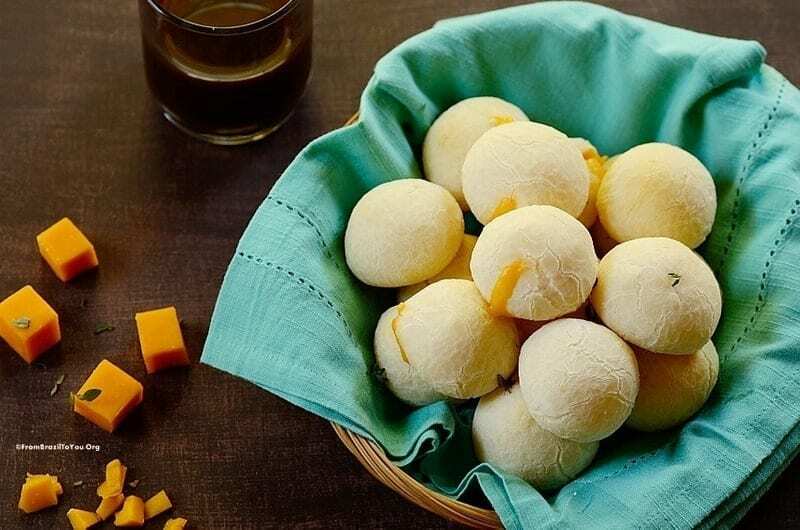 Cheddar filled Brazilian cheese rolls are naturally gluten-free and can be served for breakfast or as a snack or small party bites. Line a large baking sheet with parchment paper. Preheat the oven at 350° F (180° C). Place the tapioca flour in a large bowl and set aside. In a small saucepan, mix the milk, oil, and salt together and bring to a boil. Pour hot liquid mixture into the reserved bowl of flour, stirring well with a wooden spoon. Mix in the egg, and then add the crumbled queso fresco and grated Parmesan. Sprinkle the thyme if desired. 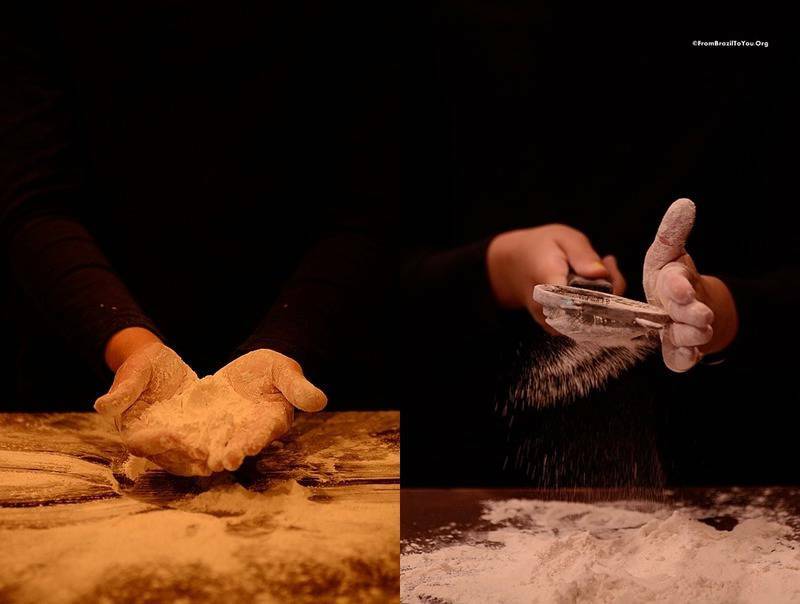 Knead the dough for about 2-3 minutes or until homogeneous. Lightly grease your hands with vegetable oil. 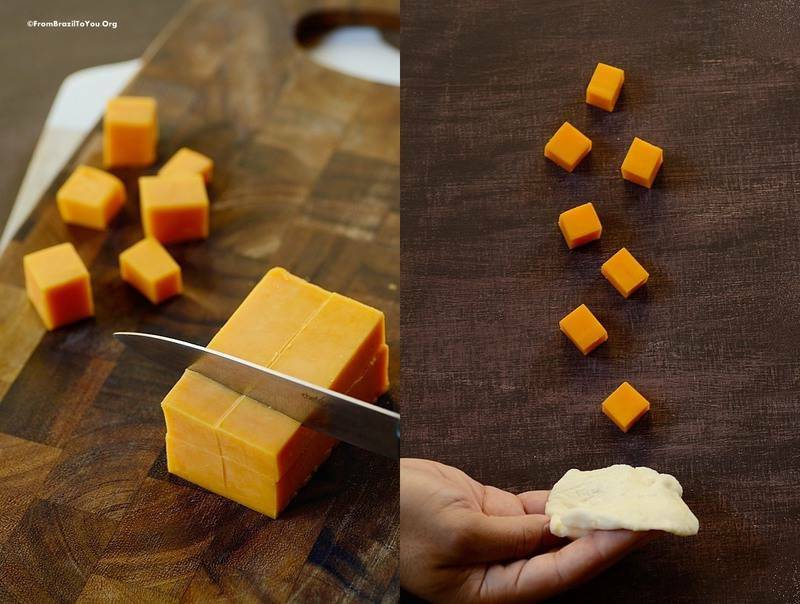 Using a tablespoon as measurement, make balls of dough and open an indentation in the center to fill in with a cube of cheddar. 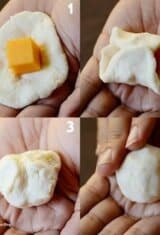 Close the dough around the cheese cube, seal tightly, and shape into a round ball, making sure there aren't any gaps where the cheese is exposed. Place the rolls on the lined baking sheet and bake for 15 to 18 minutes or until they begin to lightly brown. Serve while warm accompanied by coffee, guaraná soda, caipirinha, or other beverage of your choice. Minas cheese is used to make Brazilian cheese rolls in Brazil. Because it isn't easily available in the US, I suggested the Mexican queso fresco be used in this recipe since it is the most similar to Minas cheese. I’ve seen Brazilian rolls before and thought they were so decadent looking – only thing better are Brazilian rolls with cheddar! Thanks for sharing this Denise – my daughter would LOVE these as they are gluten free! Holy hubcaps… these cheese balls look and sound amazing. Is it traditional that you serve with coffee? I might make some of these beauties for Australia Day celebrations next week, they’d work great with a beer or even champagne I reckon. Great recipe lovely Denise. These sound amazing Denise. What a fun appetizer these would make! Wow! These look wonderful. Love cheese. Love bread. Put them together in these rolls? Bliss! They look cheesy and so good. I’ve heard of these but never made it, this is goooey and yummy. Perfect Super Bowl food! So very scrumptious! These cheese rolls have an unusual texture- they look almost like eggs with the yolk running out (but I assume it’s the cheese). Pinning this for sure! Thank you for this detail post … your hardwork and passion show here vividly. Hope 2016 is treating you nice and kind. Thank you, my dear, for the visit and always kind words. Enjoy! This is a superb meze! 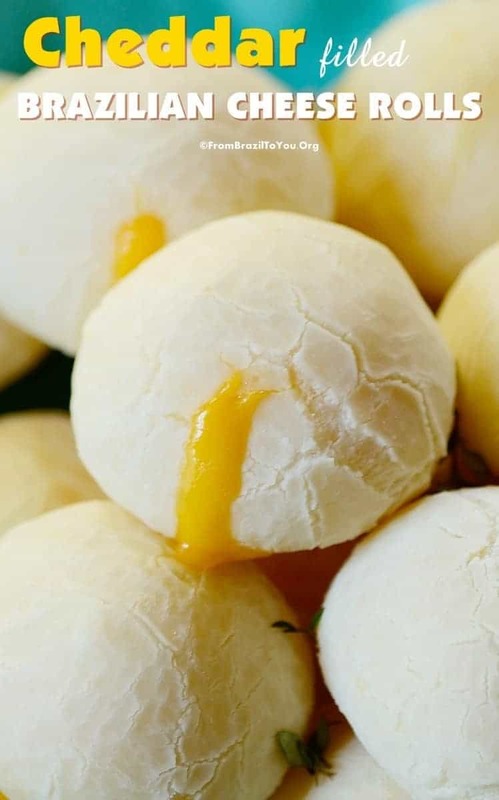 We server tyropitakia in parties which are various cheese-filled dough treats and are extremely popular, so you can imagine how much we’d LOVE to try the Brazilian version filled with cheddar! And the possibilities are endless. 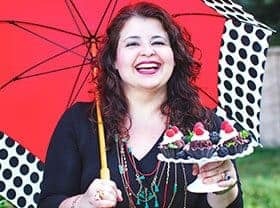 Thank you so much for another AMAZING recipe dearest Denise! Sending you lots of love from frozen Athens! We have a supermarket frozen version of this dish. I usually just buy them now I know how to make them thanks to you. So delicious, I have heard of the Brazilian cheese rolls before but never made them myself. I cannot buy tapioca flour around here though (well maybe on the Internet), could I make them with normal flour? Please, google in your area to check where tapioca flour would be available. Hello. These look amazing!!!! Sera que da pra usar mozzarella invez de cheddar? 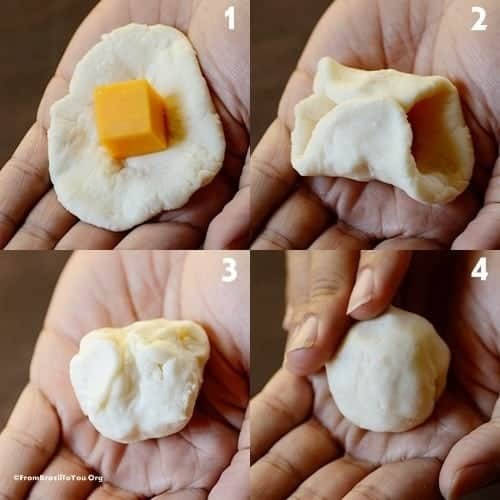 Sim, voce podera usar cubinhos de mozzarella ao inves de cheddar. Bom apetite! Hi, Anna! No worries! Parmesan cheese can be used instead. In this case, skip the salt because the Parm cheese already contains a lot of salt. If you freeze the rolls for about 30-60 minutes before baking them, it will also help to soften the dough — and the filling will stay most inside. Thanks for stopping by. Enjoy! Ficou grudenta, como uma cola. Modelei usando duas colheres…Vamos ver,o que será que aconteceu? Ola, Janis!!! A temperatura da estacao pode alterar as medidas da receita, requerendo mais ou menos polvilho doce. 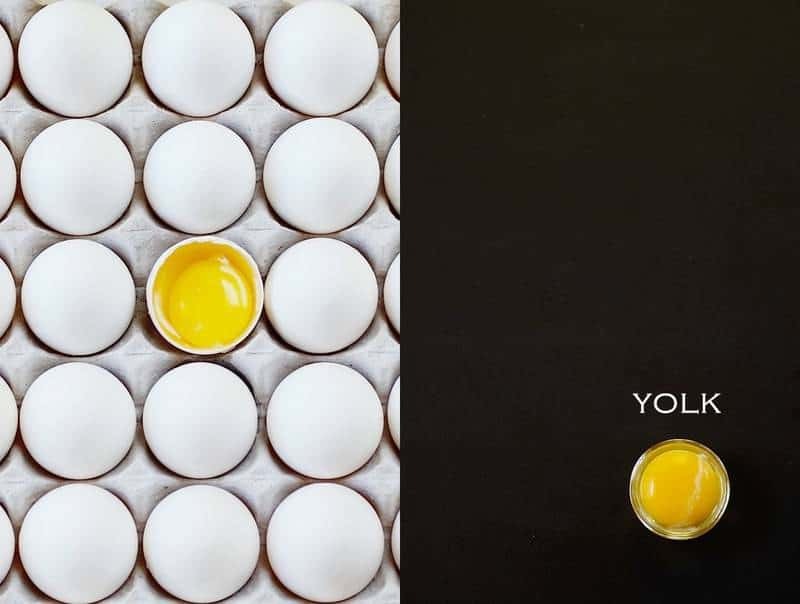 Eh por isso que escrevi na receita para colocar mais polvilho se necessario, de modo a obter uma massa firme o suficiente para enrolar as bolinhas de pao de queijo. Espero que isso ajude! Um abraco. So beautiful ! Never tried before : one more reason to do ! Thank you so much !